Hanley-based Jefferies Solicitors sponsored a special one-off performance by St John’s Community Choir this week. 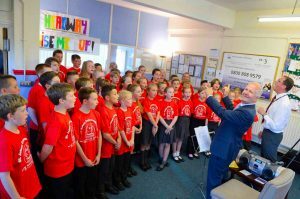 The children’s choir raised money for local charity Headway North Staffordshire to support people who have suffered a brain injury. The group has also recorded a CD with the proceeds going to the charity. The 45-strong choir, made up of children from St John’s Primary School, Wetley Rocks and Moorside High School, Cellerhead, performed their newly recorded song ‘You Raise Me Up’. The song was chosen to depict the journey of anyone having suffered a brain injury and the fight to regain independence. Around 200 guests, including clients, carers and families of those affected by a brain injury came together in harmony to raise awareness of the charity. Healthcare professionals from Brain Injury Pathway – the trauma unit at the Royal Stoke Hospital and the Haywood Hospital – also attended to show their support. Compensation specialists, Jefferies Solicitors, has been committed to the charity for many years, raising thousands of pounds during their partnership. The law firm regularly organises fundraisers such as a bike ride, marathon and charity ball, as well as being handed the Headway ‘baton’ in 2013. Around 700,000 people in the UK are affected by brain injury each year – for which there is little funding and help available for long-term support. The Headway North Staffordshire facility offers rehabilitation and respite services as well as support in the home and is recognised by the Clinical Commissioning Groups (CCGs) of Stoke on Trent and North Staffordshire as part of the brain injury pathway. Watch the fantastic performance here or below and visit the YouTube page for Headway North Staffordshire. Those who wish to donate can visit the Just Giving page here.